After taking some time to officially dip into the world of smartwatches, Fitbit now has two in its lineup. The company brought the fight to the Apple Watch with its fitness-focused Fitbit Ionic late last year, and the "mass-appeal" Fitbit Versa did its job, becoming a big sales hit for Fitbit. And while having a duo means that Fitbit is giving more choice to people looking to buy a smartwatch, it also means potential users now have a tougher decision to make. Below, we've compared the two smartwatches on design, features and price in order to help you make the right decision. Any questions? Let us know in the comment section. As with any smartwatch, you have to be on board with the design before you consider any other element. If you're going to be wearing this all day and night, you want it to look the part. And when it comes to these two smartwatches, both tick boxes in different categories. When we first set eyes on the Fitbit Ionic, it was far from our favourite in design. And though the square, angular look has grown on us the more we've tested it out and lived with it, this still feels more like a sporty watch than an everyday device you'll be wearing with more formal wear. The build itself is impressive; you've got GPS, NFC, enough battery for four or five days of life and waterproofing packed into the Ionic. It also comes in three variations – charcoal/grey, blue/orange and grey/silver. You even have third-party and official Fitbit Ionic bands, as well as an Adidas Edition to consider. As for the Fitbit Versa, you'll get a stylish design that sits in more in line with what we saw from the Pebble Time, and is even slightly akin to the Apple Watch. It's thinner and lighter than the Ionic, with the blocky look replaced by a curvier bezel. The size means it's likely to appeal more to women than the Ionic, though its wide range of bands and colour combinations mean that pretty much anyone should be able to find a look they enjoy. And despite the size, a lot is still packed underneath the 1,000 nit display. A heart rate monitor and SpO2 sensors sit on the underside of the bezel, while, like the Ionic, it's also water resistant to 50 metres and offers roughly the same battery life as its smartwatch sibling. GPS? Well, that's the real omission on the spec sheet, and one we'll explore more below. But even despite its shortcomings internally, the Versa wins out here in terms of pure design. There's no doubt it provides more of an everyday look, with more customisation and versatility in store for wearers. While you're likely to have your own preferences in terms of design, what you can't argue with are the features packed inside each device. And since these devices live inside the same ecosystem, you're getting much of the same here. That means you'll get the usual tracking experience – step counting, automatic exercise detection, sleep monitoring, VO2 Max data and continuous heart rate support – on both devices, with the Versa also being used to debut new, dedicated female health tracking. This will also be coming to the Ionic once the Versa releases, too, and represents the first push from a major company into tracking that the company claims goes beyond menstruation health and reproduction cycles. Fitbit Coach is present on both devices, though unfortunately this still only offers the same three original exercises which came initially through the Ionic. Since the pair are both in the smartwatch category, you'll also get the usual bells and whistles attached. Fitbit Pay, notifications (including quick replies if you're on an Android phone) and music storage are all present on the Versa and Ionic, as well as the ever-growing Fitbit Gallery – the home for its apps and watch faces. Updates to Fitbit OS also means users will have also have more data on the wrist than ever before, there's a new dashboard on both that brings the app's big feature to your wrist. You're still going to want to dip into the companion smartphone app in order to get the fullest look at your data, but things like step count history and heart rate trends will now all be available to view on the wrist. Now, while it's all a very similar package, there's one key difference we touched upon earlier. That is, those who want to head out and have their exercise tracked without their phone will want to steer clear of the Versa, due to its lack of inbuilt GPS. It can still tether to your phone and provide information on your location, but true exercise fans will likely see more value in the Ionic. And while that may not be the biggest factor for you personally, it does mean that the Ionic edges past the Versa slightly in the features department. With the Versa offering slightly less in the features department, and looking to appeal to as many people as possible, it's understandable that it comes in cheaper than its sporty sibling. Standard versions of the newer smartwatch will be available for $199.99, while its special editions, which include a woven strap instead of a silicon one, will retail at $219.99. Considering the dearth of smartwatches currently available at the same price point, the strength of Fitbit's ecosystem and the potential for improvements in software down the line, this is a pretty reasonable starting price for the Versa. Expect that to come down around the holidays – maybe even reaching $150 near Black Friday. As for the Fitbit Ionic, you'll have to shell out $299.99 – with the Adidas Edition also coming in at the same price. That's slightly cheaper than the Apple Watch and Samsung Galaxy Watch. However, we should note that the Ionic is consistently sold cheaper at other retailers. Both of these devices represent a strong value for money when compared to rivals in the area. Whether you value GPS – the big difference between the pair – enough to shell out more for the Ionic is entirely up to you. 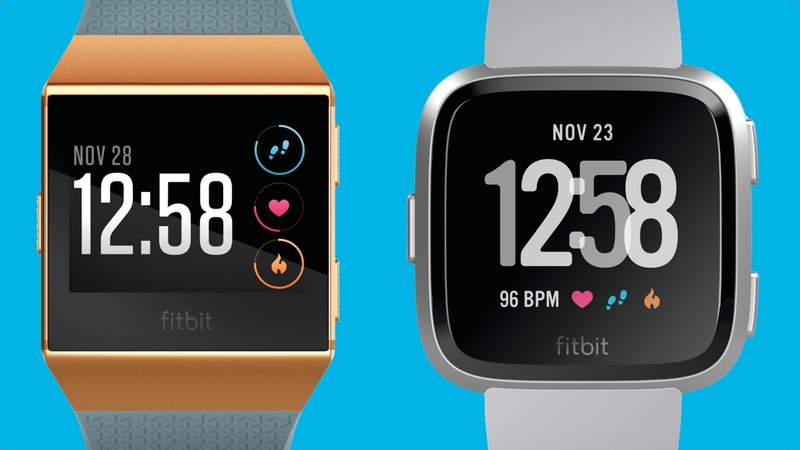 While Fitbit's two smartwatches don't differ too greatly in terms of on-wrist experience, the contrasting designs and significant price gap means that there are two very different targets here. The Versa will appeal to more people, with its smaller, everyday look also likely to compete with the Apple Watch better than the Ionic currently does. However, with that said, the lack of GPS really is a frustrating one. It makes sense that Fitbit isn't launching a device directly in competition with its own, and would in turn omit the feature, but built-in GPS does feel like it should be a standard feature in the category at this point – even in the relatively budget space the Versa sits in. The bottom line here is that if you're looking to get in on the ground floor of smartwatches, and want a stylish option to boot, it's very tough to find a better option at the same price point as the Versa. For those wanting a slightly more advanced tracking experience, and can tolerate the design and potential $100 mark-up, the Ionic is still providing a slightly better experience. I'll be getting the versa just based on looks and the fact that I don't need GPS. It's not a price difference of £100. Amazon, Curry's & Argos all sell the Ionic at £239.